Hundreds of households in fuel poverty in South Wales are set to benefit from a new wave of community investment in solar panels, following a fund raise of up to £1 million from investors seeking possible better returns on their cash – and maybe also the warm, fuzzy feeling of doing some good. 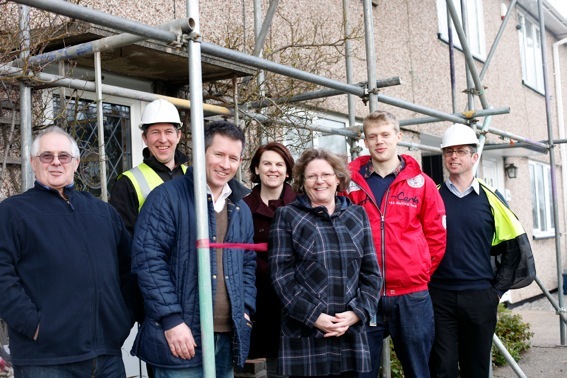 Gen Community, a London-based low carbon co-operative, installed the first solar panels on a household in fuel poverty in Newport, South Wales, last week and aims to reduce fuel bills for those homes that will receive panels. The co-operative has so far raised £205,000 from 75 investors and hopes to reach £1 million by February 25 when the offer closes. The money will be used to install solar panels on the roofs of hundreds of homes in Newport – a town blighted by fuel poverty. If the offer is fully subscribed, Gen Community will be able to install panels on 240 homes currently in fuel poverty in the Newport area. At the minimum subscription of £390,000, about 70 homes will benefit. The project could have significant environmental benefits too, delivering 631MWh of electricity and resulting in a carbon reduction in the area of 271 tonnes of carbon dioxide per year if the target is reached. There are around 4.5 million households in the UK in “fuel poverty”, according to the latest figures. Fuel poverty is defined as fuel costs accounting for more than 10 per cent of household income. Experts are predicting that the UK will also move towards community ownership of energy, as households increasingly seek ways to reduce their fuel bills and as investors seek potentially better returns on their cash than they can receive from standard bank accounts, which currently pay a derisory average of about 1 per cent. There are also expectations that retail investors may possibly begin shifting their money to more socially-conscious opportunities in the coming months. Gen Community is one of a number of co-operatives that are sprouting up around the country to fund community ownership of renewables, however the UK is lagging behind other countries where community-ownership has become normal. In Germany, 65 per cent of energy comes from renewables projects owned by individuals, co-operatives, and communities. In Denmark, the figure is more than 75 per cent. Bright Funding Limited, a London based company which invests in renewable energy assets, has pledged to invest any shortfall to ensure the project reaches its minimum investment threshold of £390,000 and can go ahead. See Trillion Fund’s directory for more details of this raise and others. Trillion fund is a platform for those interested in renewable energy investment.